This topic gives you step-by-step instructions to make your Project Online sites and projects accessible to people with disabilities. Project Online sites tend to be highly visual, and people who are blind or have low vision can understand them more easily if you create your sites and projects with accessibility in mind. The following table includes key best practices for creating Project Online sites and projects that are accessible to people with disabilities. Look for charts, tables, and text in your project sites that are hard to read or to distinguish from the background. To find instances of color-coding, visually scan the content in your project sites. For example, add an underline to color-coded hyperlink text so that people who are colorblind know that the text is a link even if they can’t see the color. For headings, consider adding bold or using a larger font. To find potential issues related to fonts, review your data for areas that look crowded or illegible. For people who have dyslexia or have low vision, reduce the reading load. For example, they may benefit from familiar sans serif fonts, such as Arial or Calibri. Avoid using all capital letters and excessive italics or underlines. Add a description to your site and projects. Check that the site and project descriptions have a meaningful text. People who use screen readers sometimes scan the site contents. Clear and accurate information about the site and project content help users to navigate and decide whether the information on the site or project is relevant for them. Add alternative text for your site logo. Check that the logo description has a meaningful text. Avoid using text in images as the sole method of conveying important information. If you must use an image with text in it, repeat that text in the document. In the alternative text, briefly describe the image and mention the existence of the text and its intent. Project Online provides predefined site designs that include accessible colors and fonts. In Project Online, select the settings menu icon . In the settings menu, select Change the look. In the list of site designs, select the design you want. On the design details page, select Try it out. To use the design, select Yes, keep it. The new design is applied to your site. In Project Online, select the settings menu icon. In the list of site designs, select Current. 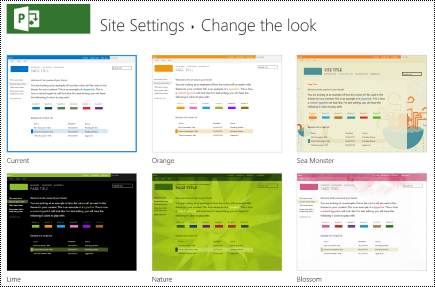 On the design details page, select the current color scheme palette in the Colors menu. In the menu, select the new color scheme. To use the new color scheme, select Yes, keep it. The new colors are applied to your site. You can customize Gantt charts designs to make them more accessible. You can, for example, change the bar color. In the settings menu, select PWA Settings. In the list of PWA settings, select Gantt Chart Formats. 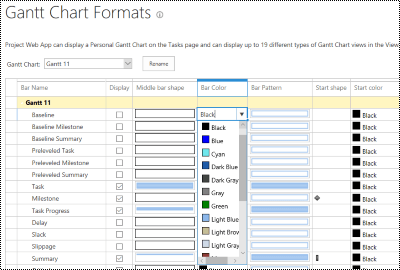 In the Gantt Chart: menu, select the chart you want. In the chart details table, make the changes you want. If you want to save your changes with a different name, select Rename. Type a new name for the chart and then select OK.
On the design details page, select the current font scheme in the Font menu. In the menu, select the new font scheme. To use the new font scheme, select Yes, keep it. The new fonts are applied to your site. In the settings menu, select Site settings. 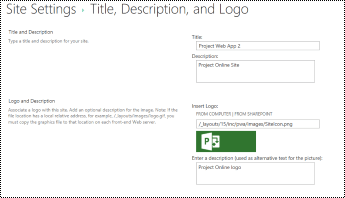 On the Site Settings page, select Title, description, and logo. In the Description: text field, type a short description of the site. In the Project view, select the project you want. 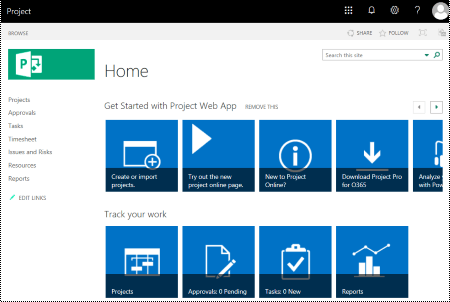 In the navigation pane on the left, select Project Details. 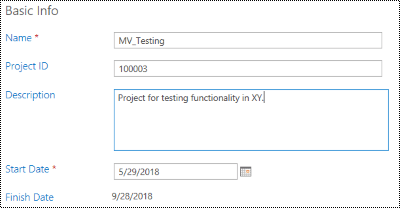 In the Description text field, type a short description of the project. In the Enter a description (used as alternative text for the picture): text field, type a short text describing logo.